Cheeky Teddy Visits the Little Chap! Last Thursday, at the end of my first, fraught ‘week‘ back at work and the Little Chap’s first ‘week’ at pre-school/day nursery, we had a surprise visitor. I didn’t just have the Little Chap’s nursery bag to take home with us, but also a second marked CHEEKY TEDDY. I was very excited to be taken home by the Little Chap today. His Mummy drove us home in the car. It didn’t take long. When we got home the Little Chap and I did a jigsaw with his Mummy and Daddy. The Little Chap likes doing jigsaws – his Mummy says he is quicker than she is at finding the right pieces! It was then time for the Little Chap to go to bed. 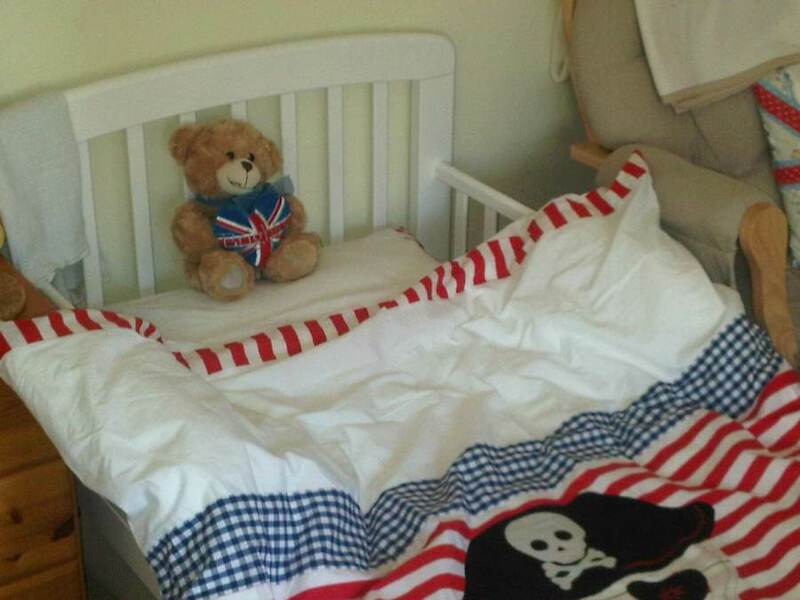 He introduced me to all his teddies and I got to sleep in his new ‘Big Boy Bed’ with his special blue teddy. The Little Chap didn’t have to go to nursery today. We stayed at home with his Mummy. She had bought the Little Chap a magazine so we spent some time reading it and doing some puzzles and stickers. The Little Chap also played with his trains. After lunch, the Little Chap tried on some new clothes his Mummy had bought for him, as he’s grown so much! I thought he looked very smart. The Little Chap’s Daddy looked after us this morning, as his Mummy went to London to do a cookery class she was given for Christmas. We went for a walk into the village and had a Babycino in Cafe Rouge. We met the Little Chap’s grandparents, Mama and Bapa. They had a tall tree fall down this week – right in their back garden. It fell because of the high winds. Mama was very sad as her plants were ruined and Bapa was cross because he now needs to rebuild the fence! The Little Chap and his Daddy bought them a nice book on gardens to help them put theirs back together. The Little Chap and his Mummy and Daddy drove him into the village this morning. They had some jobs to do and some shopping – a birthday present for their friend, M. They chose a book of recipes as M likes cooking – the Little Chap says her cakes are the best! That afternoon, we went to M’s house for tea with her family. She has a little boy too, but he is very big because he is 28 and a grown-up. The Little Chap enjoyed a slice of her birthday cake and watched Winnie the Pooh on his Daddy’s laptop. The Little Chap was sad this morning, as his Daddy had gone to work. He gets up very early, before the Little Chap and his Mummy, so he can be home in time to see the Little Chap before he goes to bed. The Little Chap was soon happy again when his Mummy took him to Creative Fun Factory. The Little Chap got to sing and dance and play lots of fun instruments. The cymbals were his favourite. I thought they were noisy! When the Little Chap got home he had some lunch. The Little Chap left me at home because he had to go back to nursery. His Grannie collected him after lunch on Tuesday and took him home to her house, where he played and had some tea. He then came home to see his Mummy and Daddy, have a bath and a story and go to bed. I sat on his bed all day and looked after it. The Little Chap stayed all day at nursery on Wednesday and gave me big hugs at bedtime as it is my last night at his house and he says he will miss me and doesn’t want to give me back. I told him not to worry. I’m very excited about seeing his teachers and all my other chums again and especially about my next holiday. I wonder who I’ll visit next…? This entry was posted in Memory Lane, Parenting & Family and tagged day nursery, diary, surprise visitor, the Little Chap by Mayfair Mum. Bookmark the permalink.